Smart and sophisticated, the Jasper Black Stool Black Velvet is a timeless design that is set to impress. Transforming a classic design with luxurious contemporary finishes, the Jasper radiates a sense of suave modernity that will never go out of fashion. 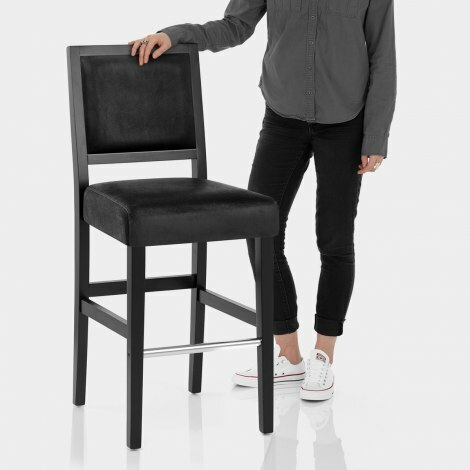 The high backrest offers ample support, whilst the generously padded seat provides comfort as you sit. Both are upholstered in beautiful black velvet, matching the chic black finish on the solid wooden frame. Bracing bars connect the four legs for strength and stability, whilst a sleek chrome footrest at the front exudes a modern flair. Protective floor plugs sit concealed beneath to help minimise marking to floor surfaces, ensuring the Jasper is a first class model that delivers style as well as substance. "Really pleased with these stools"
These stools met my aspirations. Perfect height for my kitchen bar which is part of the lounge. The stools compliment my sofas. Really pleased with the quality and the added comfort whilst sitting. The delivery was also efficient and assembly instruction was very clear. I'm absolutely a completely satisfied customer. Really pleased with these stools and stand out in the kitchen.